I don’t know why it is that travellers are routinely described as ‘weary’. If I’m describing myself, I just say I’m a traveller – not a weary one. But when travel publications refer to havens for the weary traveller; and weary traveller’s resting places; and recharging the weary travellers batteries and the like, you start to believe the hype. So after a long day on the road when we arrived in Victorian mallee town Hopetoun looking for fuel and were overcome by a sudden and inexplicable travel weariness, instead of driving on to our planned destination these two (newly) weary travellers decided to stop and look for somewhere to stay. Luckily for us, Hopetoun delivered. And delivered so well, we stuck around for a couple more days to check it out. Which we enjoyed so much, in 2014 we sandwiched a week at nearby Wyperfeld National Park between two more Hopetoun stays. Because travellers (whether weary or not) who use Hopetoun as a base to explore Western Victoria’s mallee region will find AT LEAST five good reasons why Hopetoun Victoria makes it onto our TOP Aussie Town list! Our camper trailer is like having our very own portable micro-nation. It’s the one constant in our travels – we know what’s in it, where everything is, how it works. So it’s a rare day on the road that I’d rather sleep somewhere else. But who wouldn’t want to sleep in a Silo? The Silo Cabins are just two of the quirky and inexpensive accommodation options built from local materials like wood, stone and corrugated iron at The Mallee Bush Retreat on the shores of Lake Lascelles. Even the public loo gets the rustic treatment!! The Retreat’s brochure description – ‘an ideal stop for not only the weary traveller but people seeking adventure and excitement’ – was a sign, so I suppressed my disappointment at foregoing the pleasures of snoozing in a silo, and we set up on one of the several grassed, powered sites overlooking the lake. Which with its easy access to an excellent amenities block, camp kitchen, lakeside fire bucket AND low price tag* quickly became one of our all-time favourite powered campsites ANYWHERE! In fact, cheap powered sites and FREE unpowered sites make Hopetoun an attractive alternative to camping at Wyperfeld National Park (see #5 below) 40 km away on a fully sealed road (to the southern entrance) – since 1 July 2014 it costs between $34-$37.80** for an unpowered campsite. I don’t know from whom I inherited the compulsion to walk around the perimeter of any given (smallish) lake I find . But despite our travel weariness, we soon gave in to the urge to circumnavigate Lake Lascelles’ shores – an easy 30 minute walk. More if you’re there at sunset or sunrise with a camera handy. 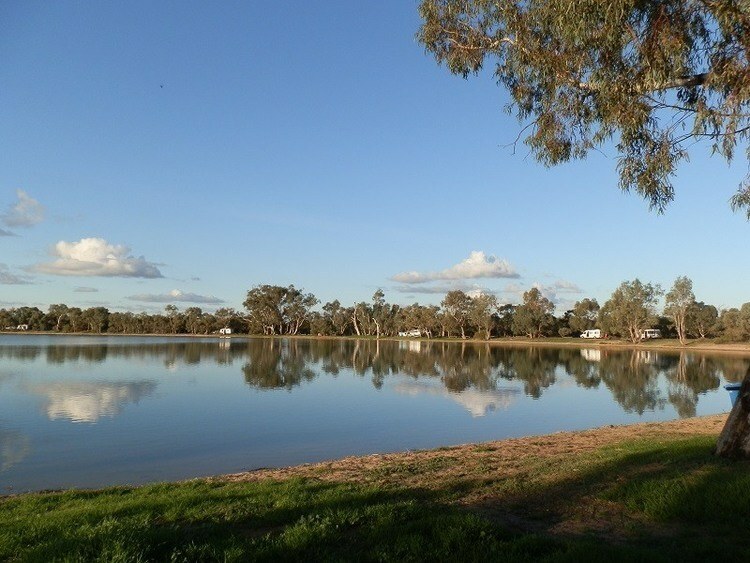 Named for EH Lascelles, one-time owner of local Corrong Station, the lake is always full thanks to the Grampians-Wimmera Mallee Pipeline. And that meant the sensational sunset, sunrise AND moonrise reflections had me regularly jostling for the best vantage point. Yes, my friends, that’s why I have elbows! Pilchard’s elbows get used if anyone’s between him and a clear view of the birds that find the lake an attractive home, or in the case of avian weary travellers – staging post! And at night, the welcoming glow of campfires all around the lake tells us we’re (sadly) not the only weary travellers to have discovered this killer campground! Where does one go when the energy-depleting effects of exercise, exploration and elbow-nudging takes their toll on ones energy reserves? In Hopetoun that’s an EASY question. The Bow Bakery, of course!! An off-shoot of the bakery in nearby town Rainbow (RainBOW bakery, geddit?) it’s another reason why weary travellers might want to break their journey in Hopetoun. And then visit Rainbow for a go at the original Bow! It’s a little off the beaten track if you’re not visiting the northern section of Wyperfeld National Park (see below), unless you’ve heard of Patchewollock’s BIG attraction – and my all time favourite Australian BIG THING – the BIG Malleefowl! 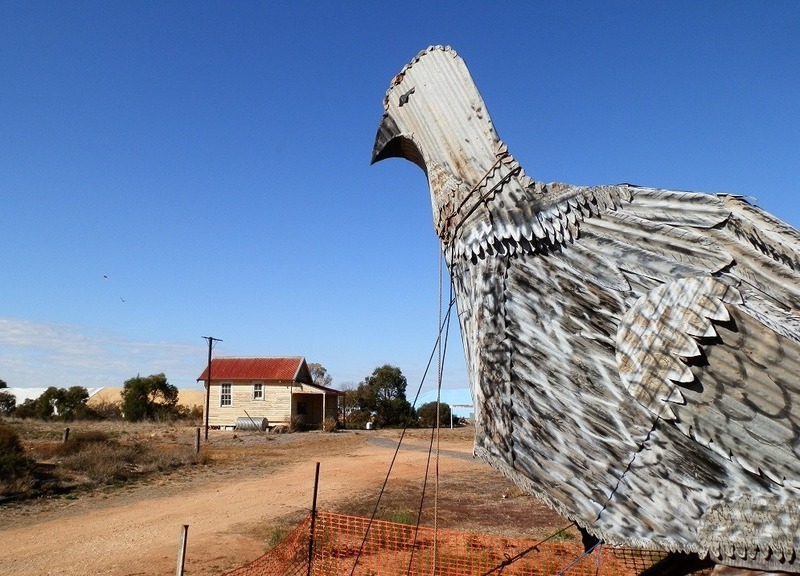 Since my only visit to this awesome creation a few years ago, my complimentary*** copy of The Little Book of Big Aussie Icons tells me there are now TWO Big Malleefowl – with rumours they’re going to breed, which means eggs and chicks in the future. The day of Hopetoun Visit #2 was actually meant to end at Wyperfeld National Park. Ever since a day trip on Visit #1, we’d planned to return to this mallee wonderland, one of several Victorian Mallee National Parks collectively covering over 1,000,000 hectares. But another attack of lethargy-inducing travel weariness forced (!) us to settle for somewhere with facilities to recover from our exhausting ~6 hour drive (including bakery stops – Lameroo is GOOD!). One night turned into two – but in our defence, Hopetoun’s excellent main street was the perfect place to stock up with supplies for a few nights in the mallee wilderness. And so the long weekend we’d planned for Wyperfeld turned into a week! Spending 7 days in Wyperfeld was easy. We hiked the Desert Walk through a strangely beautiful fire-ravaged dune system, recovering from the summer bushfires 6 months before. We walked through spinifex and sand dunes to Mt Mattingley lookout on the Discovery Loop, explored the Park’s history at the Visitor Centre, and its habitats on the Tyakil Walk. We climbed Flagstaff Hill at sunset and drove the Eastern Lookout loop, searching for Mallee Fowl on the Lowan track. And sometimes we just walked along the roads. While the park and surrounding area is a 4WD mecca, that meant our walk/rest/eat/sit-around-the-campfire-when-your-travels-make-you-weary lifestyle in the zero degree night air (it WAS mid-winter!) passed relatively undisturbed. But if you want to know what avid 4WD enthusiasts talk about around the campfire after a hard day on the tracks, then you’ll have to come to Wyperfeld on a long weekend too!! If sand dunes, space, spinifex, solitude and scenic loos – the Wonga Campground loo is in MY BOOK – aren’t your thing, then Wyperfeld probably won’t thrill you as much as it did me. In which case, head for Hopetoun and hope like hell the Bon Bon Cafe and Takeaway is still serving their killer pizza! Back in Hopetoun with 8 days of washing piled up, a pantry ready for re-stocking and two weary travellers in dire need of a shower we reclaimed our site at the Mallee Bush Retreat and sat back waiting for the sunset. Then the moonrise. Two more nights, and we reluctantly left this little gem in the middle of the mallee despite so many reasons to stay. But many reasons to stay means we know we’ll be back! Like this post? Why not register to get RedzAustralia updates via email HERE! THEN … share it (buttons below)! *** Complimentary because MY photo of Ballina’s BIG Prawn is in it! Next Post: Walk Wild Wilkawillina! I have never responded to a blog before but I wanted to tell of amazing hospitality in Hopetoun. 12 months ago we rolled in to Hopetoun wet and bedraggled from camping in the rain. We walked into what may have been a council office to ask what accommodation was available. The lovely lady there (Jacquie?) told us about the silos. Thinking we didn’t have dry bedding she offered to go home and grab some doonas for us to use. How amazing is that? The silo accommodation was awesome and cheap. We have just returned home from that area again and again caught the rain. Getting petrol, my brother asked the best way back to Wodonga. Well he was taken home by Peter from the Hopetoun petrol station for coffee and thorough directions. Tourism is a real boost for these towns. By the way, we do our grocery shopping at them rather than pour profits into the big supermarket chains. And the pub does a great meal! I’m honoured that your first comment is on my blog, Elizabeth! And what a great story – it confirms to me that Hopetoun is an awesome place to visit or even just to stop over. We’ve had nothing but courtesy and friendliness from the locals which is why I’ve tried to repay that by writing about our great experiences there. We also shop local – the bakery is FAAAAAABULOUS – because we want all the facilities to be there next time we visit. We shopped at the excellent supermarket and had a great pizza at the takeaway – can’t wait to try the pub next time! Maybe we’ll see you there?!?! I have visited Hopetoun many times as My Fathers family were early settlers of the Hopetoun West area,We were last there in October 2015,visited My Grandparents graves and Dads old farm at Hopetoun West now owned by the Afford family who are distant cousins.The Lake again way fantastic as was the Museum always leave with a heavy heart and a tear in My eyes.Keep up the good.work always feel if I am a part of the district even though I was born after My parents left to go to Manilla NSW My Mothers home town. Thank you for sharing what Hopetoun means to you, Jim – I knew it was a special place from the first time I went there, although I have no family connection to the area like you do. But now I have an emotional connection – it’s a wonderful area and I hope to get there again soon. Who knows? Perhaps we’ll meet there someday! Thank you for your comment, Peter! It’s great to get some more of the local history from those who know it much better than I do. It’s an interesting place to visit, and I hope to get there again sometime soon! A National Park and a nearby bakery; great combo, we’ll never grow weary of that! 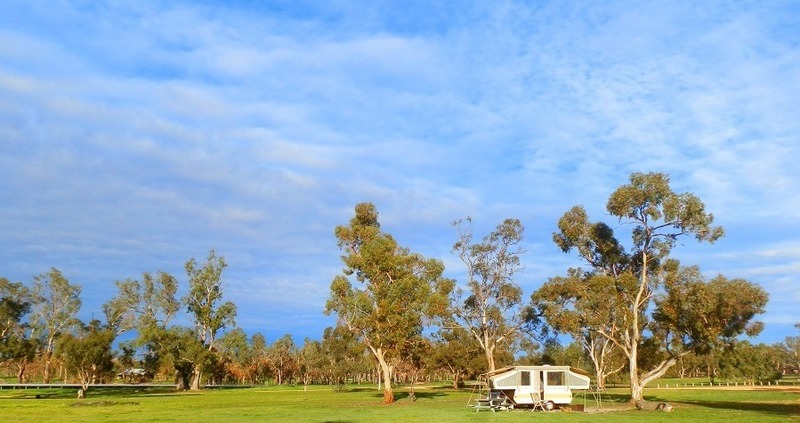 The Mallee Bush Retreat sounds like a great find. Thankfully Parks Victoria has come to their senses and reduced most of the fees again so Victoria is back on our trip plan. They’re both worth saving your strength for, NPO!! And I’ve also heard the good news about Vic Parks – we stayed in Wyperfeld before the price increase and love it, but vowed to just trek in each day from Hopetoun if the price stayed up! Happy travels! Stunning pictures. Very interesting post. Fantastic! Thanx, Imagebloke! So far, the lake’s been good for a sunset shot (or 20) on every visit! Gorgeous photos, Red. It sounds like you had a blast exploring, even if you were so ‘weary’! Did you include a bakery just for me? I’m going to pretend you did! Hanged if I know why the brochures, papers etc, refer to weary travellers, could be due to such distance on the long haul between sleeps. I can see why you would want to go back there again and again. Just those lakeside sunsets would be enough to draw me. I remember finding Rainbow on my map once, years ago, and wishing I could live there because the name sounds happy. Once we arrive, it’s just too hard to leave, River! I’m sure one day we’ll be there WITHOUT a killer sunset – but so far, that hasn’t happened! One day I’ll find out why ‘Rainbow’ was named and by whom – I wonder if whoever it was just wanted to live in a place that sounded happy too??!! Have a great weekend, my friend! Some amazing photos you’ve given us here. Being weary is just a sign of a day well spent! Haha, couldn’t agree more with your use of ‘weary’, John!! Glad you like the pix – have a great weekend! Sigh, your photos, Red. Just gorgeous. That first photo. Wow – like a fire in the sky. Those silo cabins look awesome! Such a clever idea. I too think “weary”, when attributed to travellers (these days) is over used in some publications. I would love to see a post about your camper fit out – and what you pull it with. There are some truly drool worthy camper vans out there which make my feet itch. I remember taking the in-laws camper on holiday from time to time, and it was so much fun – especially the trip from Albany across the Nullarbor, over to the Blue Mountains, down through NSW and ACT into Melbourne, through South Australia and home again. She was simply fitted out and super comfy for hubby, I and our then ten year old son. A great, tough little camper. You have certainly made the area look attractive. The mallee fowl looks rather good. I remember in New Zealand when we had motor home, some of the best powered sites were the cheapest. It might be of interest to your readers to describe your camper trailer in more detail. People are inclined to spend a lot of money on monster motor homes now and so it would be interesting to know how little you can get by with and yet still be comfortable. We’ve moved away from the more popular caravan parks in the last couple of years, Andrew – too crowded, too expensive, and they all have ‘entertainment’!! We are great believers in ‘less is more’ with our rig – I’ll describe it in more detail in a future post. That’s a great idea – don’t know why it’s never occurred to me before!! Red, I’ve never had an idea to stay at a Silo!!! It sounds like an old tale, doesn’t it? And your story this time is so adventurous. At least for me. Thank you for an exciting story that couldn’t be in my life, and I just started twitter, so feel free to follow and share mine, too! You’ll have to come down here and stay in the silos, Kozue – your friends at home won’t believe you!! We are always looking for new and interesting places to stay and things to do – just wait to see where we go next!! If you’re anything like us, you’d love it, Jo-Anne! I hope you get the chance to see it for yourself and prove me right – or wrong!! Maybe it’s time for Tim’s next holiday?!?! wow Red that first photo looks like has been painted. You can’t beat a sunset reflected on a lake can you. I love the idea of those silo cabins. 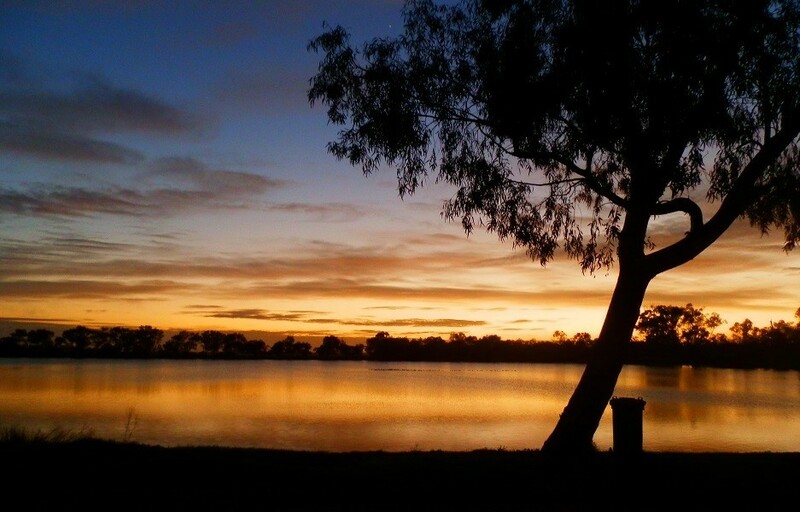 Sounds like Hopetoun Victoria and the mallee area are places to add to our list for when we get to Victoria and the camping area looks very peaceful. “Patchewollock” ? now there is a name for you! Sunsets and water are my two favourite things, Jill!! It’s amazing when the effects of light, reflections, ripples and colours – and my camera settings – all come together to produce something like this! 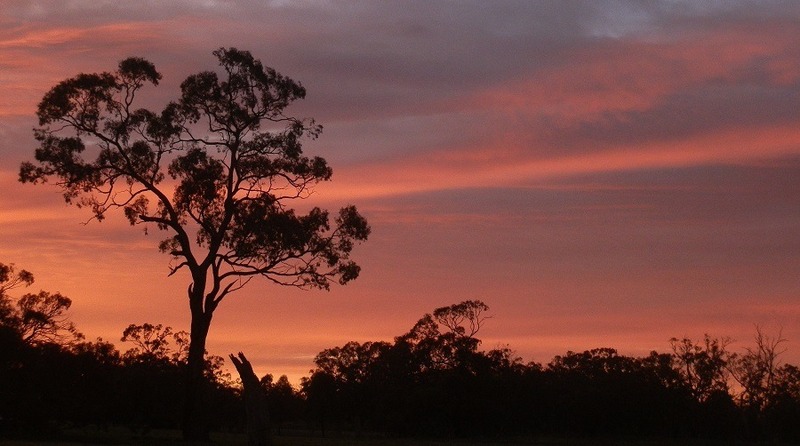 If you like the Outback, you’ll LOVE the mallee! And you just gotta visit a place when it’s called ‘Patchewollock’! I guess the term ‘weary traveller’ may have been borne in the days when folks walked (or trudged) for hundreds of miles. Another gorgeous post, lovely photos! Thank you for sharing! Oh yeah … I guess driving for 6 hours, unbroken but for bakery stops, doesn’t quite qualify in the ‘weariness’ stakes!!!! I suspect you’re right about the origins of the phrase – but that doesn’t stop us from misusing it these days!! Glad you enjoyed it!! Ha ha, just love that big Malleefowl! I actually come from Victoria but I have never really explored the Mallee area nor been to Hopetoun. I’m now regretting I didn’t spend more of my wasted youth discovering what Victoria has to offer. Beautiful photos as usual Red. Nice to learn there are still free campsites! The Wyperfeld National Park could really be in Grimm´s tales! And yes, soooo good when plans can get skipped and a day turns into a week or two, sweet, sweet memories! Our weary-places were Perth, Carnarvon, Broome and Darwin btw. Oh, and some nice spots somewhere in the Outback. Love your style to write – sooo dangerous, too. If I was a Hippie, I´d packed and left already for good following your steps! Haha, was travelling myself in 98/99 and didn’t even know blogging existed!! It’s not possible to see all of Australia on one trip – unless that trip lasts for at least 10 years 😀 Lots of free camps these days too, Iris – although not so much in WA! A lot of smaller towns now have a low- or no-cost camping area (often at a sports field or showground) to attract visitors to their towns – it really works!